Do you want to live in The Real America? As one of the most listened to nationally syndicated radio talk-show hosts and the driving force behind the Rallies for America, Glenn Beck entertains, inspires, and informs millions of listeners. 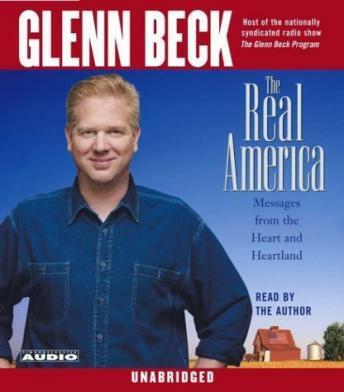 In The Real America, Beck continues telling it like it really is, cutting through the fog of modern-day pundits and pontificators who have made it their mission to undermine and underestimate the greatness of America, our strength as Americans, and the power of the American spirit. I liked the ideas and thoughts and hope that the vision Glenn had for the future of America comes to pass. For the first 3.5 disc I was debating whether to give this four stars or five. He has some great insights about life in the U.S., although he's more than a little utopian. I was truly looking forward to my daily commute. Unfortunately, then he turned into Glen "Moonbeam" Beck and went into excruciating detail about his personal journey from self-loathing drunk to happy-happy cult member. Good book if you like Glenn. Very honest about himself and the problems he has overcome. I liked it.